My very creative daughter gave me a really cute notebook for Christmas. It has graph paper on the inside and love on the outside 🙂 She likes taking ordinary covers and turning them into something wonderful. In this case, she matched my personality perfectly. I love the crochet theme of the cover. She also made me a cute little bookmark to go with it. I love the colors she used. Purple is one of my favorite colors. 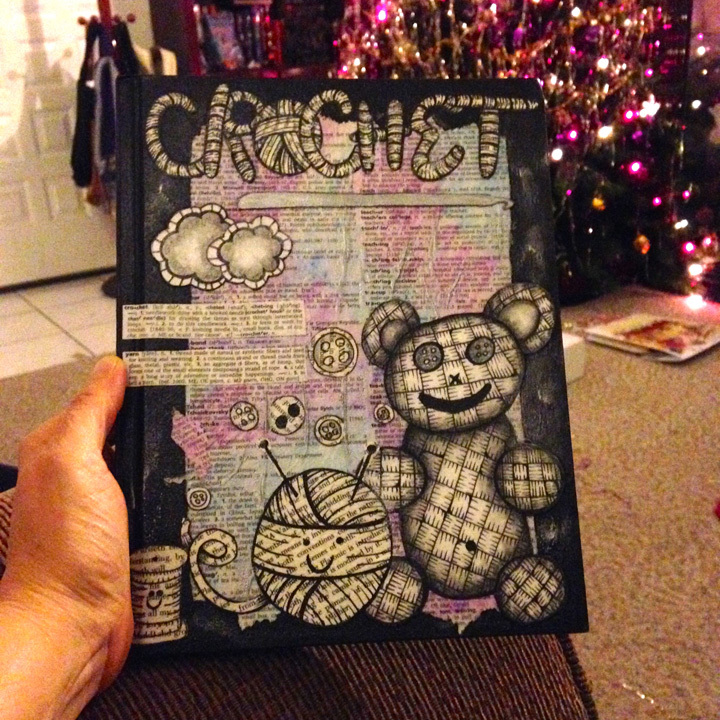 The notebook’s purpose is to house my crochet inspiration when it strikes. Sometimes I use graph paper to flesh out a project. If I’m going to create something new, I think about it for awhile. I wonder and think about what I need to do to get the results I want. Then the work starts to make the project a reality. 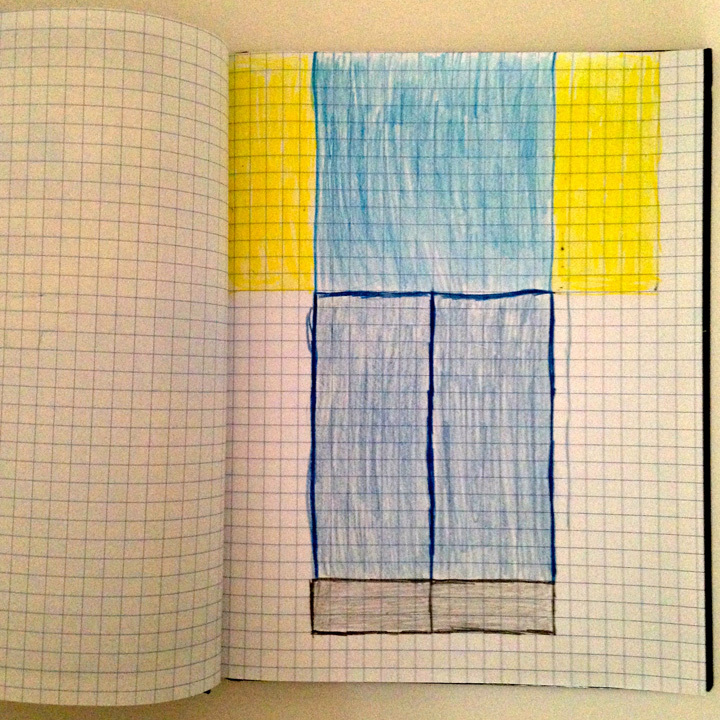 I might draw a picture to help me flesh out what I want or I might use graph paper to give me scale and layout. 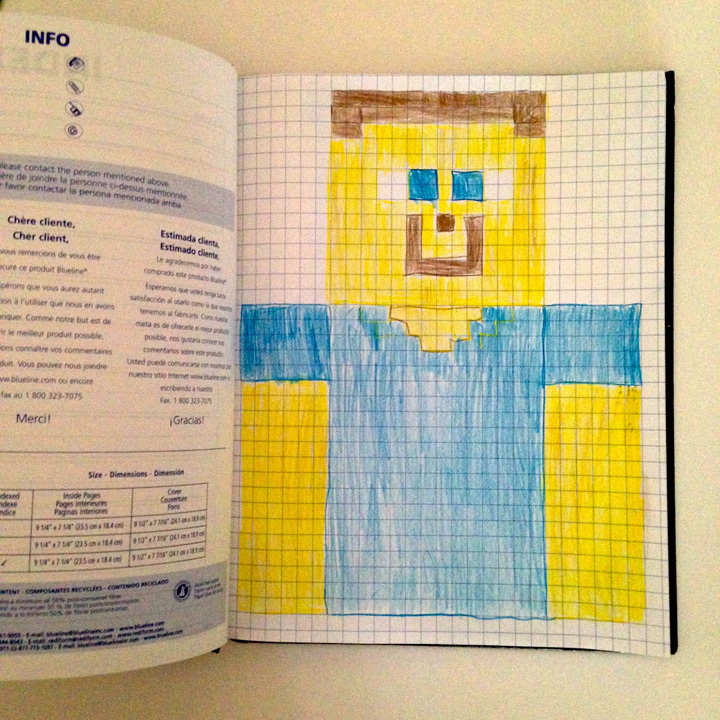 I decided that my first use of the notebook was to help me remember what I did with the Minecraft doll I’m currently working on. I have most of the pieces done and will be ready to start sewing and stuffing soon. I found that the graph paper was perfect for recording what I did. Each graph square represents a single crochet. Coloring the squares was extra fun but it also represented the different colors I used and the color changes. I had to split the design over two pages but it’s a nice record of what I did (am still doing since it’s not finished). Now I need to do the dimensions of the sides of the doll. My daughter gave me something so I could create and record my patterns but I bet she didn’t realize she also gave me a coloring book! I tend to make a lot of girl stuff when I crochet. I make pretty girl dolls, pretty girl purses, pretty girl hats. You get the idea. Unless someone asks me to make something specifically masculine like say, my husband or son, then whatever I make is going to be girly. That’s why I decided to make some ‘boy’ things when I knew I was going to do a craft fair at the elementary school where I work. I already had the girly, pretty items and needed some things the boys would like. That’s when the idea for creating Minecraft items was born. I run an after school program and the boys (and the girls too) are heavily into Minecraft, so I shifted into high gear (naturally, I waited until the last second to start crocheting these items) to produce something I thought they would like. 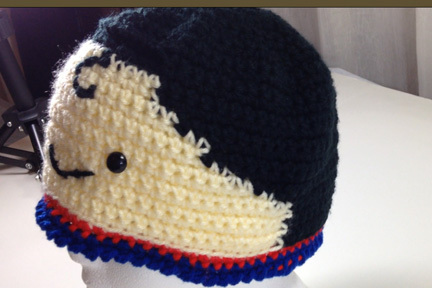 I managed to make three beanies (a picture of the beanie is in the previous post) and one doll. The doll was a big hit. I found out from the children that the character I recreated was called Steve. I just copied the character from pictures of the game and had no idea what it was called. When the kids picked it up, they would excitedly tell their parents it was Steve from Minecraft. I then pretended I knew that all along :-). That doll sold and now I’m making another for a family member who wanted it also. Of course, I didn’t write down what I did. Luckily, I took a picture of it so I can sort of, kind of, figure out what I did to make it again. My first attempt at a Minecraft Doll. I am pretty happy with it. Now that I’ve done it once, I know what I found difficult and what I would do differently. For example, when I started this one, I planned to create the straight edges by making rows and crocheting in the back post when ever I needed an edge. I did that with the head and the body. By the time I was ready for the arms and pants, I got the bright idea to do panels and sew the hard edges together. I ended up with so much sewing, I instantly regretted doing it that way but I was stuck so I finished the same way. In the end, I was happy with the results but I think the new one is coming out better. 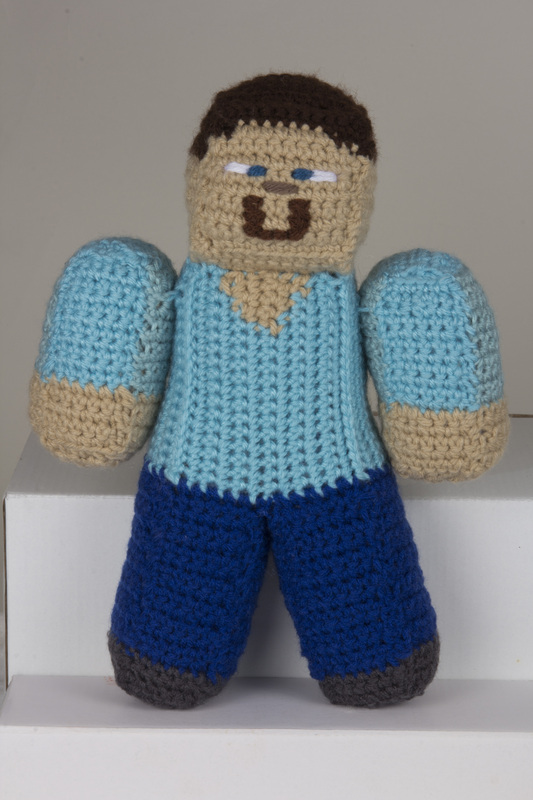 My next post will be about my process for making the new and improved Minecraft doll (without all the extra sewing)! I’m so excited! 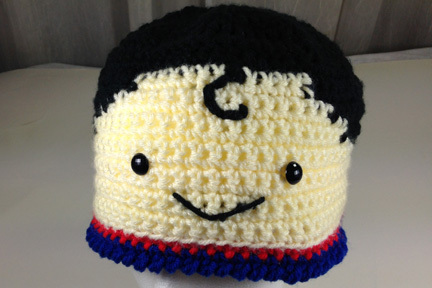 I just sold a beanie to someone I met at a craft fair where I had a booth selling my crochet. 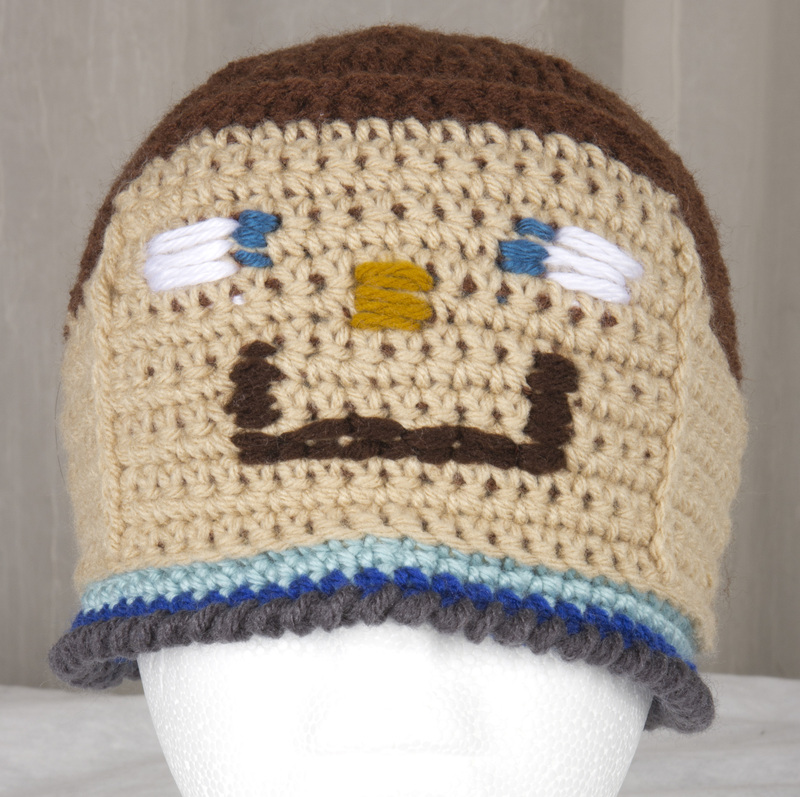 The person bought a Minecraft beanie I had made. This is like the hat that sold. He asked if I could make one with superman as the theme. I told him I was up to the challenge and I went for it. He showed me an illustration that looked very simple to duplicate. I delivered it today and he loved it. Here’s what it looked like. This is the actual hat I delivered today. A side view that shows the color work. Instead of crocheting in the round for these hats, I opted to crochet in rows since I wanted the ‘hair’ to go down the sides of the face in graduated steps. I did my increase rows in the same way I would as if crocheting in the round, top down. Yarn! Hooks! Buttons! My tools of the trade. I love getting and playing with my tools and materials almost as much as crocheting. Sometimes I think I have a problem… but not very often! I have a nice assortment I’ve collected over the years. 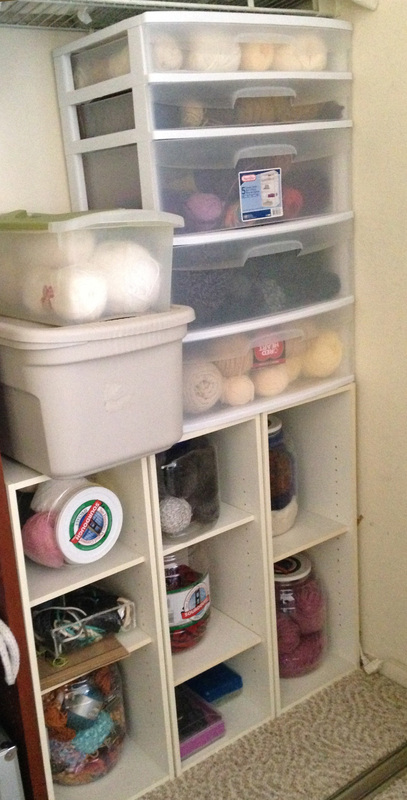 Part 1 of my yarn storage. It will never look this clean again! Part 2 of my yarn storage. 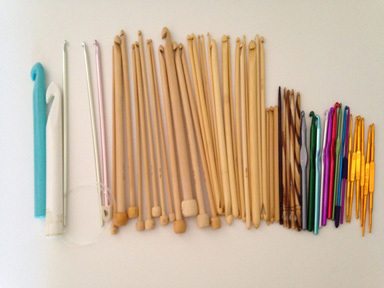 Loosely organized by color. My yarn collection is a nice size. I’ve gathered yarn from many places. I mainly buy it at the usual places like Joann’s or Michael’s but much of my collection has come from yard sales, gifts from others, and sometimes even craigslist. Sometimes, I pull it out and just dream of the things I might make some day. I know some fellow crocheters and knitters who only buy yarn for a specific project but I like being surrounded by possibilities! My hooks are another source of joy. I have some that my mom gave me when I was young, some that I bought at craft stores, my long bamboo Tunisian crochet ones I bought online and my special ones that were given as gifts. This is one collection I bought on ebay. It was 2 lbs!